Chris Champion’s brother is also a wrestler, former WCW jobber Mark Starr, who teamed with Chris Kanyon in “Men at Work”..
Chris Champion formed a tag team with Sean Royal known as The New Breed, a team that travelled from year 2002..
Chris Champion then went to USWA where he teamed with his brother Mark Starr in a team known as “WildSide”..
October 12, 1986–CWF: Mark Starr & The Falcon defeated The New Breed (Chris Champion & Sean Royal). October 14, 1986–CWF: Dewey Forte defeated Chris Champion & The Cuban Assassin in a handicap match. October 19, 1986–CWF: Dewey Forte defeated Chris Champion. October 26, 1986–CWF: Chris Champion defeated Mark Starr. October 30, 1986–CWF: Kendall Windham & Ron Simmons defeated Chris Champion & The Cuban Assassin. November 4, 1986–CWF: Ron Simmons defeated Chris Champion. November 11, 1986–CWF: The Falcon defeated Chris Champion. November 18, 1986–CWF: Chris Champion defeated Chick Donovan. December 6, 1986–CWF: Chris Champion defeated Jim Backlund. December 7, 1986–CWF: Chris Champion defeated Mike Allen. March 17, 1987–CWF: The New Breed (Chris Champion & Sean Royal) defeated Brady Boone & Ed Roberts. November 26, 1987–UWF: The Sheepherders (Sheepherder Butch & Sheepherder Luke) defeated The New Breed (Chris Champion & Sean Royal) in a steel cage match to retain the World tag team titles. December 4, 1987–UWF: The Sheepherders (Butch Miller & Luke Williams) defeated Chris Champion & Ron Simmons. January 14, 1988–NWA: Chris Champion defeated Rocky King. February 11, 1988–NWA: Chris Champion defeated Black Bart. February 19, 1988–NWA: Chris Champion defeats The Gladiator #1. March 4, 1988–NWA: Chris Champion defeated Pez Whatley. March 6, 1988–NWA: Chris Champion defeated Shaska Whatley. April 22, 1988–NWA Jim Crockett Sr. Memorial Cup: Chris Champion & Mark Starr defeated The Twin Devils (Curtis Thompson & Gene Ligon) in the 1st round. The Powers Of Pain (The Barbarian & The Warlord) defeated Chris Champion & Mark Starr in the 2nd round. May 19, 1988–NWA: Ron Simmons defeated Chris Champion. May 24, 21, 1988–NWA: Al Perez defeated Chris Champion. June 3, 10, 1988–NWA: Larry Zbyszko defeated Chris Champion to retain the NWA Western States Heritage title. September 1, 1988–NWA: The Russian Assassin #1 defeated Chris Champion. September 11, 1988–NWA Worldwide: Chris Champion defeated David Isley. September 18, 1988–NWA: The Sheepherders (Butch Miller & Luke Williams) defeated Chris Champion & Mark Fleming. October 8, 1988–NWA: The Sheepherders (Butch Miller & Luke Williams) defeated Chris Champion & The Italian Stallion. May 15, 22, 29, 1989–USWA: Chris Champion & Mark Starr defeated John Paul & Tracy Smothers. June 5, 1989–USWA: Wildside (Chris Champion & Mark Starr) defeated Alan Reynolds & Jimmy Masters. June 10, 1989–USWA: Chris Champion & Mark Starr defeated Deuce Mason & Frankie Lancaster. June 17, 1989–USWA: Chris Champion & Mark Starr defeated Ken Raper & Van Van Horne. June 19, 1989–USWA: Chris Champion defeated Tracy Smothers. June 24, 1989–USWA: Action Jackson & Billy Travis defeated Chris Champion & Mark Starr to retain the CWA tag titles. June 26, 1989–USWA: Bill Dundee & Nightmare Freddie vs. Wildside (Chris Champion & Mark Starr) ended in a no contest. July 8, 1989–USWA: Chris Champion & Mark Starr defeated Action Jackson & Billy Travis. July 10, 1989–USWA: Wildside (Chris Champion & Mark Starr) defeated Action Jackson & Billy Travis to win the vacant CWA tag titles. July 15, 1989–USWA TV Taping: Wildside (Chris Champion & Mark Starr) defeated Chris Frazier, Freezer Thompson & Tim Hall. July 17, 1989–USWA: Chris Champion defeated Lou Winston. Nightmare Freddie defeated Chris Champion. July 24, 1989–USWA: Jeff Jarrett & Ricky Morton defeated Chris Champion & Mark Starr in the 1st round. August 14, 1989–USWA: The Rock ‘n’ Roll Express (Ricky Morton & Robert Gibson), Jason, Jeff Jarrett & Nightmare Freddie defeated Brickhouse Brown, Chris Champion, Harold Harris, Iceman Parsons & Mark Starr in a Texas Death match. August 21, 1989–USWA: Brickhouse Brown, Chris Champion, Iceman Parsons & Mark Starr defeated The Rock ‘n’ Roll Express (Ricky Morton & Robert Gibson). August 26, 1989–USWA: Jerry Lawler defeated Chris Champion. Chris Champion & Mark Starr defeated Jason & Nightmare Freddie. August 28, 1989–USWA: The Rock ‘n’ Roll Express (Ricky Morton & Robert Gibson) defeated The Blackbirds (Action Jackson & King Parsons) and Chris Champion & Mark Starr in a 3-way tag team match. September 4, 1989–WCWA: Wildside (Chris Champion & Mark Starr) defeated The Rock ‘n’ Roll Express (Ricky Morton & Robert Gibson) to retain the CWA tag titles. December 16, 1989–USWA: Chris Champion & Steve Austin defeated Dirty White Boy & The Soultaker. December 27, 1989–USWA: Chris Champion defeated Dirty White Boy. January 1, 6, 8, 1990–USWA: Dirty White Boy defeated Chris Champion. January 10, 1990–USWA: Chris Champion defeated Dirty White Boy. January 14, 1990–USWA: Brian Lee & Robert Fuller defeated Chris Champion & Dutch Mantell to retain the tag titles. January 15, 1990–USWA: Chris Champion defeated The Soultaker by disqualification. Dirty White Boy, Jerry Lawler & The Soultaker defeated Chris Champion, Dutch Mantell & King Cobra. January 29, 1990–USWA: Chris Champion defeated Dirty White Boy. February 2, 1990–USWA: Chris Champion & Dutch Mantell defeated Brian Lee & Robert Fuller by disqualification. February 5, 1990–USWA: Chris Champion defeated Dirty White Boy. February 7, 12, 1990–USWA: Dirty White Boy defeated Chris Champion. February 19, 1990–USWA: Chris Champion defeated Rockin’ Randy. March 9, 1990–USWA: Chris Champion defeated Chris Youngblood. March 24, 1990–USWA: Chris Champion defeated Ken Raper. Ben Jordan, Chris Champion & Mike Awesome defeated Ken Raper, Lou Winston & Rooster Cogburn. March 26, 1990–USWA: Jerry Lawler & Ronnie P. Gossett defeated Chris Champion & Mike Awesome by disqualification. April 2, 1990–USWA: Chris Champion defeated Rooster Cogburn. April 9, 1990–USWA: Chris Champion defeated Lou Winston. April 16, 1990–USWA: Chris Champion defeated Lou Winston. Bill Dundee, Chris Champion, Jeff Jarrett & Mike Awesome defeated Jeff Gaylord, Jerry Lawler, Ronnie P. Gossett & Sweet Daddy Falcone. April 23, 1990–USWA: Chris Champion defeated Rockin’ Randy. April 28, 1990–USWA: Chris Champion defeated Rooster Cogburn. April 30, 1990–USWA: Dirty White Boys (Alex Porteau & Tony Anthony) defeated Chris Champion & Mike Awesome. May 7, 1990–USWA: Mike Awesome defeated Chris Champion. May 10, 1990–USWA: Inhuman defeated Chris Champion. May 21, 1990–USWA: Chris Champion defeated Mike Awesome in a looser leaves town match. May 28, 1990–USWA: John Stewart defeated Chris Champion. June 19, 1990–USWA: Shaun Simpson & Steve Simpson defeated Wildside (Chris Champion & Mark Starr). July 6, 1990–USWA: Cowabunga defeated Ken Wayne by count-out. July 16, 1990–USWA: Cowabunga defeated Scott Braddock. July 30, 1990–USWA: Cowabunga & Ken Wayne vs. Jeff Gaylord & Scott Braddock ended in a double count-out. August 6-7, 1990–USWA: Cowabunga & Ken Wayne defeated Downtown Bruno & Jeff Gaylord. August 13, 1990–USWA: Cowabunga defeated Jeff Gaylord. August 20, 1990–USWA: Cowabunga defeated Brickhouse Brown. August 27, 29, 1990–USWA: Cowabunga defeated The Galaxian. September 3, 1990–USWA: Cowabunga defeated The New York Brawler. September 17-18, 1990–USWA: Cowabunga defeated The Galaxian. September 27, 1990–USWA: Cowabunga defeated Nebula. October 1, 1990–USWA: Cowabunga defeated The New York Brawler. October 22, 1990–USWA: Chris Champion defeated Lou Winston by disqualification. October 29, 1990–USWA: Chris Champion defeated Sheik Ali Hassan. November 5, 1990–USWA: Bill Dundee & Chris Champion defeated Samurai & Sheik Hussein. November 6, 1990–USWA: Bill Dundee & Chris Champion defeated Downtown Bruno, Samurai & Sheik Hussein in a handicap match. November 12, 1990–USWA: Doug Gilbert & Tony Anthony defeated Brickhouse Brown & Chris Champion. November 19, 1990–USWA: Chris Champion defeated Sheik Ali Hassan by disqualification. November 24, 1990–USWA: Brian Christopher, Chris Champion & Tony Williams vs. Joseph Magliano, Ken Wayne & Tony Anthony ended in a time limit draw. November 26, 1990–USWA: Doug Gilbert defeated Chris Champion. Bill Dundee & Chris Champion defeated King Cobra & Lou Winston. December 10, 1990–USWA: Joseph Magliano defeated Chris Champion. January 14, 1991–UWA: Terry Garvin defeated Yoshi Kwan in the 1st round of the heavyweight title tournament. June 5, 1993–Saturday Night: Yoshi Kwan defeated Rip Rogers in a dark match. June 19, 1993–Saturday Night: Yoshi Kwan defeated Chris Sullivan in a dark match. August 7, 1993–Saturday Night: Yoshi Kwan defeated Marcus Alexander Bagwell. August 12-14, 1993–House Show: Yoshi Kwan defeated Frankie Lancaster. August 14, 1993–Saturday Night: Yoshi Kwan defeated Brad Armstrong. August 19-20, 1993–House Show: Yoshi Kwan defeated Brad Armstrong. August 22, 1993–Main Event: Yoshi Kwan defeated Mike Winner. August 28, 1993–Worldwide: Yoshi Kwan defeated Buck Quartermain. September 4, 1993–Worldwide: Yoshi Kwan defeated Kenny Kendall. September 4, 1993–Saturday Night: 2 Cold Scorpio defeated Yoshi Kwan by disqualification. September 11, 1993–Worldwide: Yoshi Kwan defeated Keith Cole. September 11, 1993–Main Event: Yoshi Kwan defeated Pat Rose. September 11, 1993–Saturday Night: Yoshi Kwan defeated Buddy Rogan. September 18, 1993–Worldwide: Yoshi Kwan defeated Frankie Lancaster. September 18, 1993–Power Hour: Yoshi Kwan defeated Keith Cole. September 19, 1993–Fall Brawl: Cactus Jack defeated Yoshi Kwan. September 28, 1993–House Show: Bobby Eaton & Yoshi Kwan defeated Thunder And Lightning (Lightning & Thunder). October 2, 1993–Saturday Night: Yoshi Kwan defeated Bubba Baker. October 9, 1993–Saturday Night: Ric Flair defeated Yoshi Kwan. October 16, 1993–Saturday Night: Cactus Jack defeated Yoshi Kwan. October 23, 1993–Saturday Night: Arn Anderson & Paul Roma defeated Paul Orndorff & Yoshi Kwan. March 16, 1996–FMW: Yoshi Kwan defeated Hayato Nanjyo. March 18, 1996–FMW: Super Leather defeated Yoshi Kwan. March 20, 1996–FMW: Horace Boulder defeated Yoshi Kwan. March 21, 1996–FMW: Jason The Terrible defeated Yoshi Kwan. March 22, 1996–FMW: Ricky Fuji & Yoshi Kwan defeated Hayato Nanjyo & Koji Nakagawa. March 23, 1996–FMW: Horace Boulder & Yoshi Kwan defeated Hayato Nanjyo & Katsutoshi Niiyama. March 24, 1996–FMW: Horace Boulder & Yoshi Kwan defeated Katsutoshi Niiyama & Tetsuhiro Kuroda. March 26, 1996–FMW: Hayato Nanjyo defeated Yoshi Kwan. March 27, 1996–FMW: Ricky Fuji & Yoshi Kwan defeated Hayato Nanjyo & Katsutoshi Niiyama. March 28, 1996–FMW: Koji Nakagawa defeated Yoshi Kwan. March 29, 1996–FMW: Katsutoshi Niiyama & Koji Nakagawa defeated Hisakatsu Oya & Yoshi Kwan. March 30, 1996–FMW: Horace Boulder & Yoshi Kwan defeated Hayato Nanjyo & Katsutoshi Niiyama. April 13, 1996–USWA: Yoshi Kwan defeated Tony Williams. April 26, 1996–USWA: Cyberpunks (Cyberpunk Fire & Cyberpunk Ice) defeated Doug Gilbert & Yoshi Kwan to retain the tag titles. May 2, 1996–ASW: Larry Valentine defeated Yoshi Kwan by disqualification. May 9, 1996–ASW: Ben Mullins, Kid Sensation & Larry Valentine defeated Keith Arden, Ken Arden & Yoshi Kwan by disqualification. May 16, 1996–ASW: Yoshi Kwan defeated Larry Valentine. June 1, 1996–USWA: Flex Kavana defeated Yoshi Kwan. June 2, 1996–USWA: Bart Sawyer defeated Yoshi Kwan. July 22, 1996–USWA: Flex Kavana defeated Yoshi Kwan. 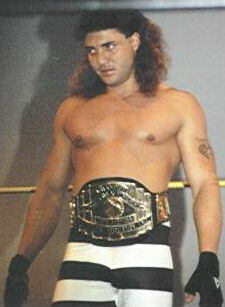 Chris Champion is currently wrestling in the Middle Tennessee area and has been tag team champions with Blackie West. January 27, 2006–Southern Wrestling Federation: The SS (Blackie West & Chris Champion) defeated JP Jones & Max Carnage..
February 3, 2006–Southern Wrestling Federation: The SS beat Team Freedom (JP Jones & Max Carnage) to win the Tag Team titles..
October 14, 2000–NWA 52nd Anniversary Show: Chris Champion defeated Slash by count-out. August 7, 2007–XCW Mid-West: Hugh Rogue, Lonestar & Tracy Smothers defeated Chris Champion, Chuey Martinez & LA Warren. December 25, 2008–NWA Main Event: Yoshi Kwan defeated The White Tiger. January 22, 2012–SPW: Samuel, The Hood & Zamil defeated Karate Kid, Reaper & Shawn Northstar. August 22, 2018: It has been announced that Chris Champion has passed away.